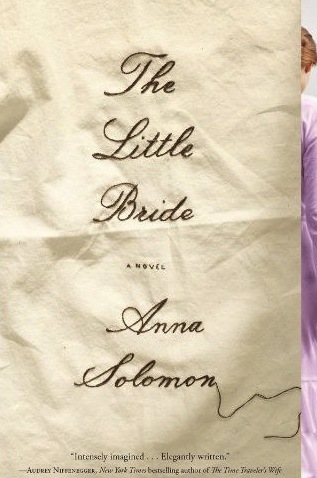 The Little Bride is Anna Solomon’s first novel. I picked this book off the “New” books shelf at the library to read after noticing on the back cover that the author received her MFA from The Iowa Writers’ Workshop. Knowing many fine writers hail from that institution, I thought this novel would be a good bet. I was not disappointed. This is a sad story about a young Jewish girl named Minna who comes to America after being orphaned and working as a servant for a horrible woman in Odessa. Her way is paid by a farmer in need of a wife. The farmer, lives on the Dakota plains and has never met or known the girl or her family previously. Minna’s story, past and present, kept my attention throughout the book. The writing is good, but I did not fully understand the character of the farmer and think he might have been further developed. As the reader, I was often unaware of what made him tick and I would like to have known more as the story is somewhat one-sided without this insight. It may just be my impression on this point. I hope some of my blog readers will offer their comments on this book when they have read it. I do recommend this book. It reminded me in a way of Willa Cather’s work which I have always loved. This entry was posted in Uncategorized and tagged Anna Solomon, Books, Dakota, farming, Jewish, Odessa, The Little Bride. Bookmark the permalink.